6 Alternate Way – CBD Suppositories ? CBD has become quite popular as a ‘miracle supplement’ with profound health benefits and, arguably, no side effects. In short, it maximizes benefits without giving you a high, which is associated with THC consumption. If you are interested in trying out cannabis oil, but are not sure how to take it, you are at the right place. In this extensive guide, we are going to talk about the different ways to take CBD. These methods are quite similar to how other cannabinoids are consumed, including THC. So the first one method is inhalation. This is the most popular consumption method and one that most people associate with cannabis, because of smoking. However, a far better way of inhalation for cannabinoids, and much healthier as well, is vaporizing. If you want to vaporize CBD, you need to either use CBD juice or vaporizable CBD oil (CBD isolate or full spectrum). You can also vape a high CBD strain of cannabis, but that would be limited to the laws in your area. One thing about the vaporization is that it’s perhaps the most efficient method, so it works the fastest and can be the easiest to dose. The effect of CBD consumption can be felt within thirty minutes (peak effect) and it can last about one to four hours, depending on how much you have taken. The dosage control is quite easy because you can just stop as soon as you feel that it’s enough. Like we discussed, vaporization is a lot healthier than smoking; however, the thing you want to watch out for though is to avoid CBD juice suspended in propylene glycol (PG). This is because propylene glycol has toxic tendencies, according to research . The alternative would be VG, which is vegetable glycerin, and is safer than propylene glycol. So if you find the CBD oil that’s just in vegetable glycerin, you can use that. Another alternative for vaping CBD oil is to get a version of CBD vape oil that you can use sublingually or in a vape. However, you need to be careful with this method, because you can’t vape ANY CBD oil – you need to make sure it’s a CBD VAPE oil. You must check with the brand that makes it and you also might need special equipment to vape it, since not all vaporizers can vaporize all types of oils. Vaping is by far the quickest method of ingesting CBD. The next method is sublingual. This is a very common method with CBD oil and this is what you see as the tinctures that you put under your tongue and hold it there. Don’t get confused by the word tincture, which refers usually to something that suspended in alcohol. Sublingual CBD tinctures are mostly in a fatty oil like an MCT oil or coconut oil; so it’s not necessarily in alcohol. These are your true CBD oils using the cannabidiol extract from the marijuana plant. This is the second fastest method, to smoking or inhalation, with the onset being 15 to 60 minutes and the peak effects being felt in one to two hours. The effects can last for one to four hours, which is similar to inhalation. Using the sublingual method, people can consume CBD throughout the day, every four hours or so. Within the sublingual method, there are also sprays that you can just spray under your tongue and hold it there for about a minute. Tinctures are a great way to enjoy CBD with minimal hassle. Our next method is ingestion, using CBD edibles. 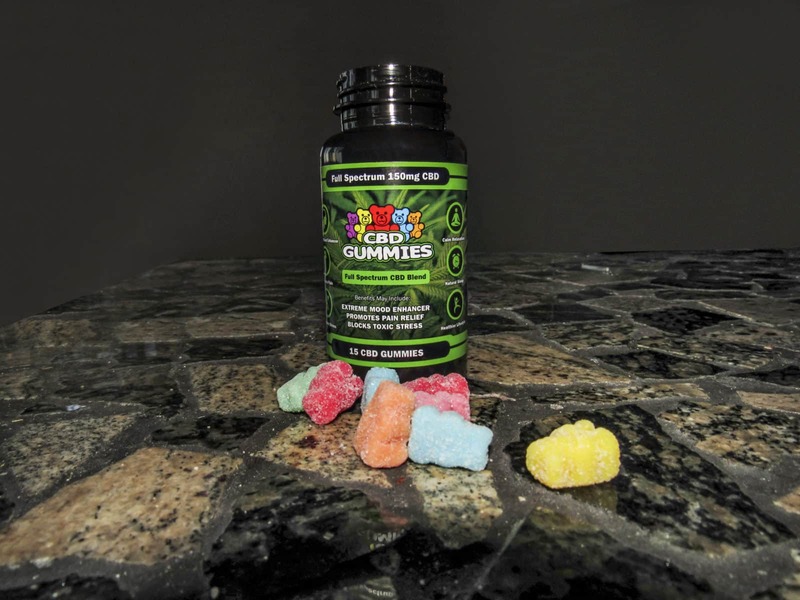 These products include CBD foods or chocolates or CBD gummies – basically, any kind of food where the CBD or cannabinoids are suspended in it. This method lasts the longest but it takes longer to kick in, with about 2 to 3 hours for you to feel it because your body has to metabolize it. Unlike the ingestion of THC, with which you have to be careful due to the conversion of THC into a stronger compound in the body, with CBD you can be a more flexible during ingestion. However, again, if you took too much of it, you might get a little sleepy or a little tired. Gummies are the most popular type of CBD edible, but there are tons of other options out there. Last method of taking CBD on our list is topical application. With this method, you can be a lot more flexible because you’re not going to get any psycho activity from it, such as feeling tired or sleepy. (Topical method even gives you flexibility with THC as you don’t have to worry about getting high). Since cannabinoid receptors are found throughout the skin layer, by applying cannabidiol oil topically, you will be able to get those receptors activated. This will increase homeostasis and healing in your body, allowing you to recoup the benefits of CBD. You can use CBD on joints for chronic pain, on skin for rashes or for eczema or psoriasis. CBD gels are often used for pain relief. Alternate Way – CBD Suppositories ? While not the most popular method of taking CBD, suppositories have the best absorption and the longest effect of all the methods. The above mentioned intake methods (except inhalation) involve CBD oil or CBD capsules or sprays, but these are not readily absorbed by the body. This is because CBD solutions are not chemically very soluble in water, which is a biggie since over 60% of our body comprises of water. Whenever you consume CBD, a lot of it is just processed by the body and is excreted as waste. In medical terms, this situation is categorized as poor bioavailability. By using CBD suppositories, you are able to have over two times the absorption compared to ingestion. The rectal membranes in your body are much more absorbent, which means that for a set amount of CBD, this method will absorb a higher percentage of CBD than other methods. The rectal membranes are also very efficient at transporting and distributing the CBD across your body, in contrast to other methods. As a user, you want to maximize the amount of CBD that gets into your blood stream, which is why you may want to consider this option. Especially, if you are treating yourself for a health issue using CBD, such as cancer, multiple sclerosis, Alzheimer’s disease, dravet syndrome, etc. CBD suppositories take quite some time to kick in your system, with effects being noticeable after ten to fifteen minutes. This is quite slow compared to the inhalation method, for instance, but the effects of consuming CBD through the rectus lasts for up to six to eight hours, which gives you a very long window. CBD oil has possible benefits for almost every part of the human body. So we have covered the most popular methods of taking CBD: inhalation, sublingual, ingestion and topical. An easy way to remember them is anything that you smoke or take into your lungs, something that you put under your tongue, something that you put into your stomach or something that you put on your skin. You don’t have to just use one method for consuming CBD; a lot of people use different kinds of CBD products. Some people like to use one way during certain parts of the day and then later on at night they use another method. For example, maybe at work you’re not going to vape (unless the office rules allow that) since it’s not really socially acceptable, so you would want another CBD product than vape oil. The most discreet method is definitely something like edible CBD or tinctures, because no one really sees you doing and there’s no smell from it. It’s pretty easy to pop a CBD chocolate or a CBD tincture at work, or in the bathroom, and keeping it very private. If you have questions, as always, leave them below.